Abstract: While Scythe doesn't overtly market its heatsinks as "silent" coolers, the company has typically produced coolers which meet the quiet esthetic. 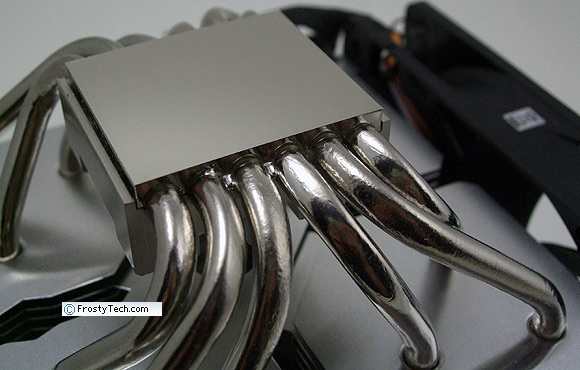 While Scythe doesn't overtly market its heatsinks as "silent", the company has typically produced CPU coolers which do meet the quiet esthetic. 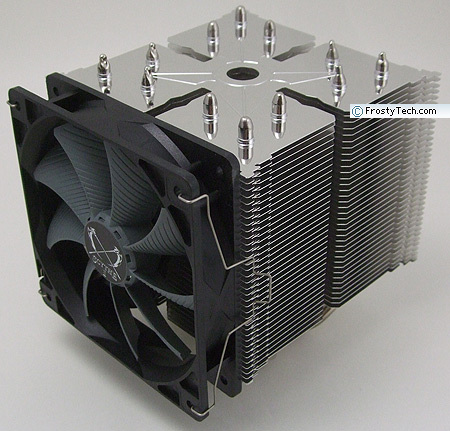 In this review Frostytech will be testing out the new Scythe Ninja 4 heatsink - a 156mm tall boxy looking thermal solution which is designed for lower noise cooling. The Scythe Ninja 4 CPU cooler weighs ~900grams and has a footprint of around 145x130mm, you'll want to measure how much clearance your motherboard offers around the CPU socket to ensure no issues. The heatsink is constructed around six 6mm diameter copper heatpipes and comes with a single 120mm PWM fan which rotates at 1500RPM to 600RPM depending on the motherboard fan controls or a physical fan speed control switch. 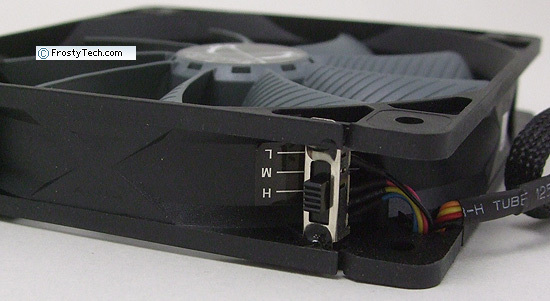 The fan produces upwards of 43.2 dBA noise according to Frostytech's real world sound measurements. Scythe's Ninja 4 heatsink is compatible Intel socket LGA2011-3/1366/115x/775 and AMD socket FM1/FM2/AM2/AM3 processors. Retail price is estimated to be around $40USD ($50CDN). Materials: aluminum fins, nickel plated copper heatpipes, copper/aluminum base. 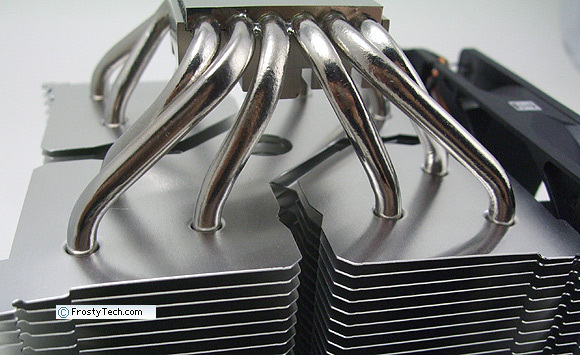 Scythe's Ninja 4 heatsink is essentially built around six, 6mm diameter nickel plated copper heatpipes which rise up from a 38x43mm copper heat spreader into the aluminum cooling fin array above. However, rather than use 122mm square sheets of aluminum for the fins, Scythe have broken up each cooling fin into basically four quarters. 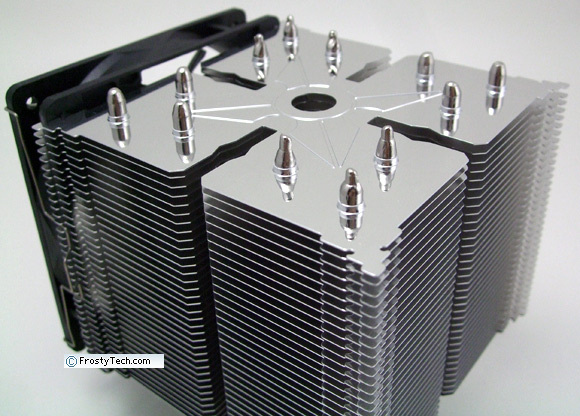 Thus, the 105mm tall aluminum cooling fin array can almost be viewed as four 56x56mm mini-towers. Each 0.4mm thick aluminum fin is segmented into two small squares and one larger diagonal strip. The pattern alternates every other row, so in essence three 6mm diameter heatpipes pass through each of the semi-independent "towers." It's an interesting design approach, intended we suspect to reduce issues with back pressure and enable a low static air pressure fan to be used successfully. The four quarters, as viewed from the top. To better deal with uneven heat produced by multi-core processors, the Ninja 4 heatsink adopts a solid copper heatspreader. The heatpipes are soldered to this base to lower thermal joint resistance as much as possible. The only downside appears to have been the warping of the copper plate during the solder process; it's slightly convex in one axis. The aluminum fins are swaged in place on the nickel plated heatpipes, which seems like a missed opportunity for the manufacturer to have taken the extra step of soldering the fins to the heatpipes. Scythe include a 120mm PWM fan capable of 1600-600RPM at 1.79-0.07mm H2O static pressure (85-43.5 CFM) according to manufacturer specs. The fan incorporates an integral fan speed controller which automatically sets fan speed to (H) 1500RPM, (M) 1150RPM or (L) 800RPM. Scythe's Ninja 4 heatsink is compatible with Intel socket LGA2011-v3/1366/115x/775 and AMD socket FM1/FM2/AM2/AM3 processors. 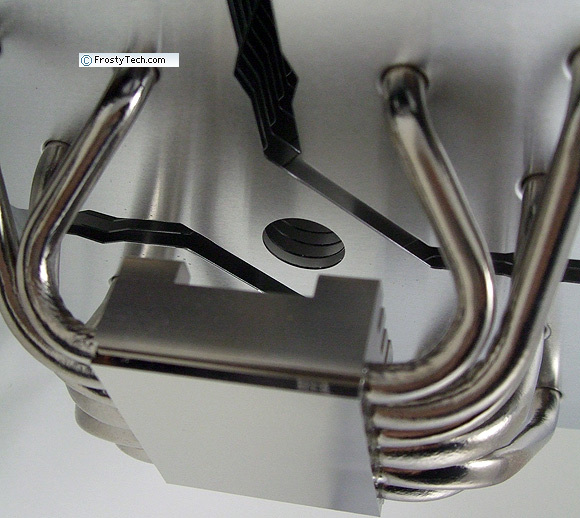 The CPU cooler ships with a pair of metal brackets that attach to the motherboard mounting holes, the heatsink is then screwed in place with a central fulcrum plate. 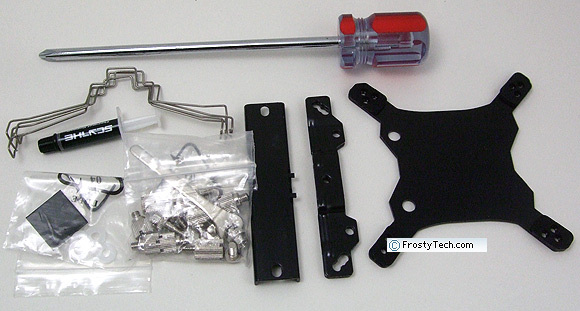 The extra-long screw driver supplied with the heatsink makes installation easy.